LS Industrial Systems (LSIS) has won a solar power plant order from Japan, proving its competitiveness in the global PV market. This is the company's third order in Japan, following its 40MW Mega Solar Park Power Plant order from Mito New Town and a 39MV power plant order from Chitose. 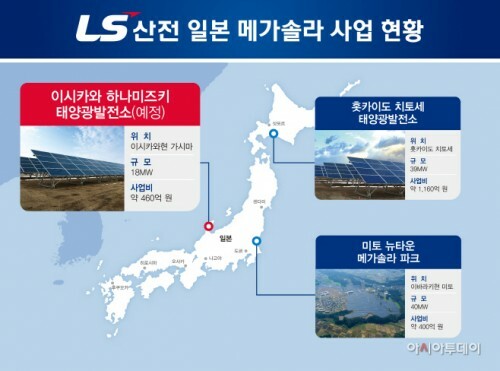 LSIS announced on Thursday that it has recently been selected as a construction and operation company for an 18MW Hanamizuki solar power plant to be built in Ishikawa Prefecture, Honshu of Japan, by signing an EPC turnkey project contract with the ordering company, Ishikawa Hanamizuki 1 Joint Company. The project cost is approximately 4.55 billion yen. Owned by Thai Solar Energy Company (TSE), Ishikawa Hanamizuki 1 Joint Company is a special purpose corporation (SPC) established for the Hanamizuki project. Hanamizuki plant will construct a 18WM solar power plant on a 300,000 square meters site in Kashima, Ishikawa Prefecture from this month until March 2019. After completion, the plant will supply electricity, whose amount can be used by about 5,000 households a year, to local Hokuriku Electric Power at 36 yen per kWh over 20 years. Through its Japanese company LSIS Japan, LSIS will ensure the completion with responsibility and efficiency of power generation. It will be responsible of engineering, procurement, and construction (EPC) work as well as operation and maintenance (O&M) of the power plant for the next 20 years. This project is LSIS' third mega solar project in Japan. The first project was the Mega Solar Park Power Plant project in Mito New Town, Ibaraki Prefecture, while the second one was the 39MW solar power plant project in Chitose, Hokkaido. An official of LSIS said, "The successful completion of large-scale projects such as Mito and Chitose have attracted a great deal of attention in Japan's mega solar power generation market. With solutions focused on global markets and EPC capabilities, we will start to expand our business."